Audrey Ring, Adriana Ficano, Lisa Barnes, Lilia Ciciolla and Dr. Rosalind Osgood; Donald Cleveland and Mildred Coyne, Executive Director of Workforce Education and Economic Development at Broward College; keynote speaker, James Oyola with his family and Esther Garnier and Mildred Coyne, Executive Director of Workforce Education and Economic Development at Broward College. FORT LAUDERDALE, FL — With funding from the Florida Legislature, Broward College, in partnership with the 2018MLK Day of Service Advisory Board, awarded $185,000 to 42 community organizations to support volunteer projects which honored Dr. Martin Luther King, Jr.’s legacy by transforming his memory into a day of volunteerism in the local community. 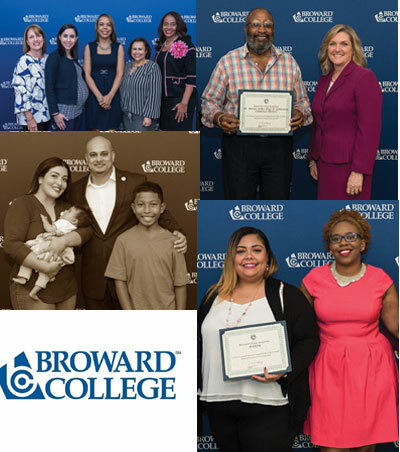 On Thursday, Feb. 24, Broward College held an awards luncheon to celebrate these community organizations. Now in its fourth year, the Broward College MLK Day of Service program received 72 applications for project funding, a 16 percent increase from 2017. Projects focused on support for veterans, neighborhood improvement projects, health promotion, environmental initiatives, education, and more. The Broward College MLK Day of Service had more than 3,073 volunteers who contributed 13,048 in volunteer hours, positively impacting 17 municipalities throughout Broward County.